Negishi Forest Park (根岸深林公園, negishi shinrinkoen) is Sakura spot in Yokohama. 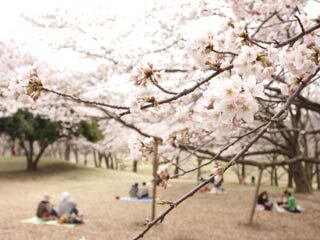 There are 340 Sakura in this park, and many people enjoy their Hanami party in early April. It is also popular for its Plum Flowers. There is a parking and restrooms. 1. use JR Negishi Line to Negishi Station. This was the first western style horse race track in Japan. Every 3rd Sunday from 13:00 to 13:45, you can ride horse. On Saturday, at the same time you can feed horses. Admission: 100 yen.